Trio Of Astronauts Return To Earth After Record-Breaking ISS Mission : The Two-Way Italian astronaut Samantha Cristoforetti surpassed a space endurance record for a female spacefarer. 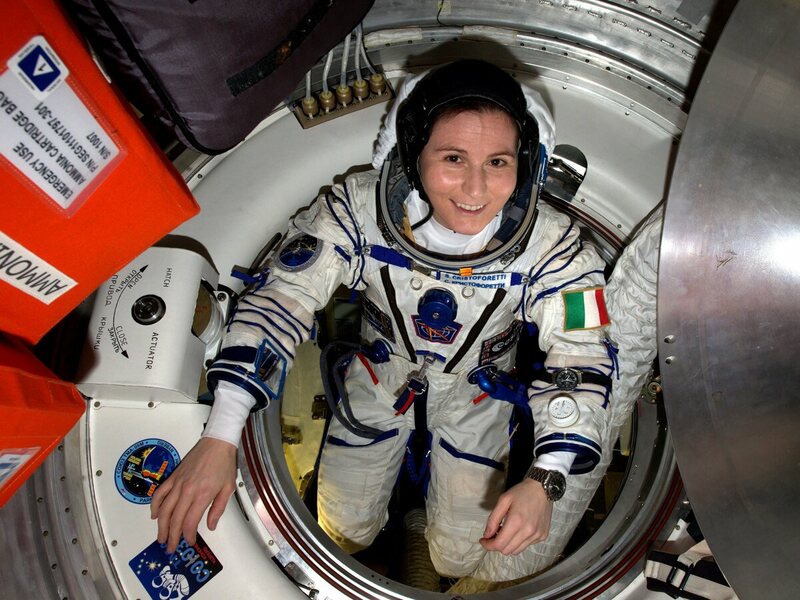 European Space Agency astronaut Samantha Cristoforetti of Italy checks her Sokol pressure suit aboard the International Space Station. Cristoforetti, who set an endurance record, is among three astronauts who returned on Thursday. Three astronauts are safely on the ground in Kazakhstan after their Soyuz capsule re-entered at the end of a record-breaking mission aboard the International Space Station. Their return to Earth was delayed by the loss of a Russian resupply ship. NASA's Terry Virts, Italian Samantha Cristoforetti of the European Space Agency and Russian Anton Shkaplerov were back on terra firma after 199 days in space. Cristoforetti's stay on the ISS broke an endurance record for a female astronaut. The Soyuz landed on schedule about 90 miles southeast of Dzhezkazgan. Its flight was pushed back after a Russian rocket carrying an unmanned Progress cargo capsule failed shortly after liftoff in April. An investigation into the failure pushed back the flight schedule for the return crew. As a result of the delay, on June 6 Cristoforetti surpassed a record set by NASA's Sunita "Suni" Williams of 194 days, 18 hours and 2 minutes in space. As the BBC reports, 38-year-old Cristoforetti "has gained an active following on Twitter during her time on the ISS by posting videos showing how to do simple everyday tasks in space such as making a meal."